What Medical Problems Does Alcohol Cause? Is Beatboxing Bad for Your Voice? It seems like there’s a smartphone app for everything nowadays, and apparently that applies even to duties performed by medical assistants. With apps like the ones listed below, it’s not hard to imagine a not-so-distant future in which smartphones are standard medical assistant tools used to check patients’ vitals. Indeed, chances are one or more of these could (at least theoretically) help make your job as an MA easier at some point during your career. Welcome to the 21st century! Medical assistants could use the iHealth My Vitals app, in conjunction with the iHealth Wireless Blood Pressure Wrist Monitor, to take patients’ blood pressure. The wrist monitor sends blood pressure readings wirelessly to an iPhone, iPad or iPod Touch, and the app captures, tracks and helps analyze the data. If a patient has the devices themselves, they could even send their readings to the doctor’s office from home and, depending on the results, might be able to skip an in-person visit. Like the Blood Pressure Wrist Monitor, the iHealth Digital Scale works with the iHealth My Vitals app, wirelessly transmitting a patient’s weight an iPhone, iPod Touch or iPad for recording, tracking and reporting. 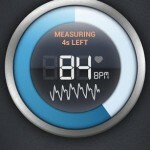 The Instant Heart Rate app can measure a patient’s pulse in seconds — without additional external hardware! Simply place their fingertip on the smartphone’s camera to generate real-time charting of every time the patient’s heart beats. The Vital Signs Camera app could turn out to be a medical assistant’s best friend, allowing measurement of breathing rate (and heart rate) without even touching the patient. It works by using the iPhone or iPad camera to detect chest movement and translate it into an accurate measurement of respiratory rate. The Raiing Wireless Thermometer is a sensor that sticks under the patient’s arm and wirelessly transmits body temperature to the Vitals Monitor app on an iPhone, iPad or iPod Touch. It can be left on to continuously monitor temperature and can send an alert if it hits a predetermined limit. Medical assistants may be asked to check a patient’s eyes for pupil dilation, and the Pupil Sizer app can aid in estimating the size of pupils by providing examples to which the MA can compare. Accurate tracking of blood sugar levels is vital to diabetics, and the iBGStar Diabetes Manager app is able to provide just that, in conjunction with the iBGStar Blood Glucose Monitoring System that attaches directly to an iPhone of iPod Touch. Pulse oximetry is a method of measuring the oxygen saturation of blood, and the iHealth Wireless Pulse Oximeter does so by simply having the patient insert a fingertip into the device, which wirelessly transmits readings through the iHealth SpO2 app installed on an iPhone, iPad or iPod Touch.